Explain the purpose of assessment, American College of Sports Medicine (ACSM) testing order, and protocol and alternatives for assessment. 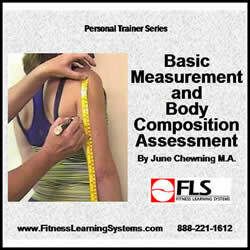 Recognize the 12 health-fitness components commonly assessed by health-fitness professionals. Discuss test validity, reliability, objectivity, and how to choose an assessment protocol. Discuss assessment administration, interpretation, and professionalism. Describe how to properly assess height and weight, resting heart rate, and resting blood pressure. Identify the 6 types of heart rates presented in this course and how they are assessed. Describe how to perform 9 body circumference measurements. Discuss skinfold assessment and describe how to locate and measure a skinfold at 9 sites. Calculate a desired weight or weight range for your client. Describe how to use the charts to determine body fat using the Jackson Pollock 3-fold skinfold method for men and women. Calculate percentage of body fat for a seven skinfold method for men and women. Calcualte Body Mass Index (BMI).